Slow Cooker Mashed Potatoes – the most delicious easy mashed potatoes, right from your slow cooker to save space on busy Holiday dinners! The kitchen is crowded, hot and crazy- but it doesn’t need to be. Using your slow cooker, you can make these Slow Cooker Mashed Potatoes without using up any precious stovetop space! Just Take Me to The Slow Cooker Mashed Potatoes Recipe Already! 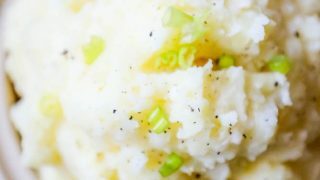 If you’d like to skip my helpful tips and tricks and get straight to this slow cooker mashed potatoes recipe already, please scroll to the bottom of the post, right above comments, where you’ll find my easy printable recipe. I get a lot of questions in comments, so I try to provide a lot of extra information for my recipes that you can easily scroll past if you’d like. 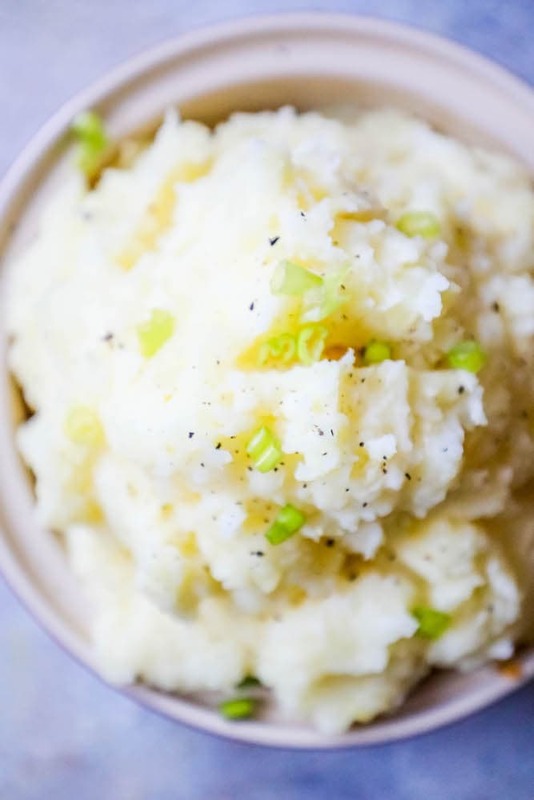 This slow cooker mashed potato recipe is fabulous because you can cook, mash, keep warm and serve straight out of your crockpot. Less dirty dishes, less stovetop space being hogged, and delicious, easy mashed potatoes! This recipe was my favorite after testing out other crockpot methods. I tried some other recipes that involved adding milk and butter while the potatoes cook- but they all curdled when I tried them, so I just went with my gut and used my own basic mashed potato recipe, but using the slow cooker to cook the potatoes. Stir in heavy cream, cheddar cheese, and chives for a rich and cheesy mashed potato side nobody will be able to resist. 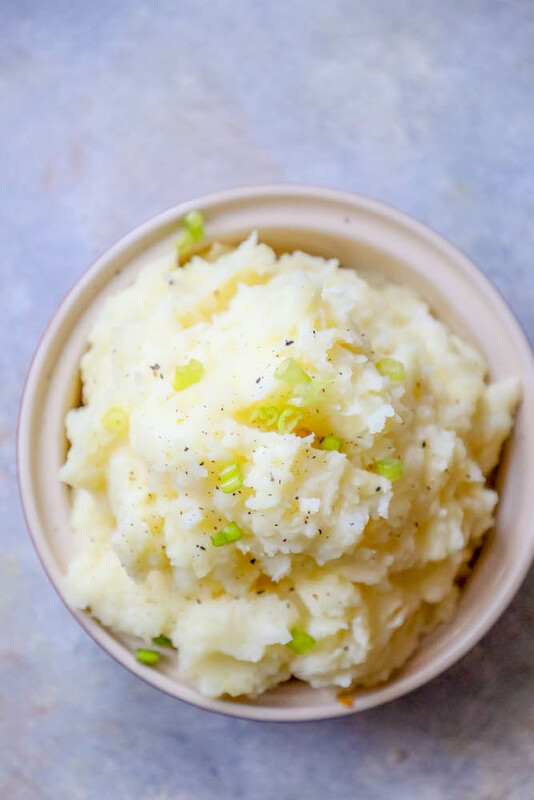 Roasted garlic, rosemary, and celtic sea salt give a lovely earthy kick to mashed potatoes. Bacon and cheddar stirred into mashed potatoes are absolutely heavenly! Horseradish and a dash of Worcestershire sauce give mashed potatoes a zesty kick. 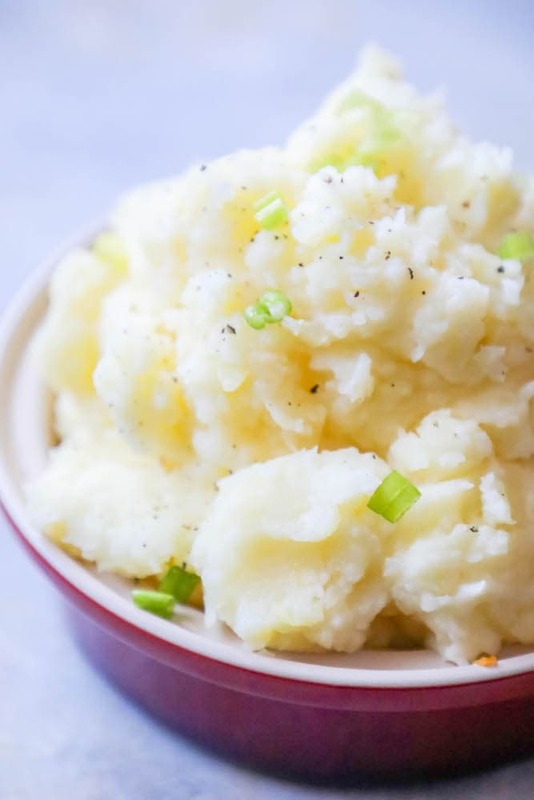 If you love this easy slow cooker mashed potatoes recipe, please check out some of my other holiday dinner favorites – there is enough inspiration here for an out of this world Thanksgiving or Christmas dinner everyone will rave about for years to come! And finally, to clear up even more space in your kitchen, check out my Smoked Turkey and take it outside. It is the best way to make turkey, ever. It stays super moist and juicy and the smoked flavor is a fantastic twist on traditional turkey. If you love this slow cooker mashed potato recipe as much as I do, please give it a five star review and help me share on facebook and pinterest! In crockpot, add 2 cups of water and potatoes. Cook on high for 1-2 hours or until potatoes are very soft to touch. Water should be almost evaporated and potatoes will mash when gently touched. If you have a lot of water leftover, drain it off. If you have under 1/2 cup, go ahead and leave it. This will help keep your potatoes from over drying while waiting for dinner to be done- so you can make them ahead of time. Add cream, butter, garlic and mash well using hand mixer or mashing utensil, right there in the crockpot. Keep potatoes on medium or low for up to 2 hours, or until ready to serve. Any chance to use less stove burners to leave room for the bigger foods to make, I’m all in. Gotta have them taters for the holidays! This is the perfect slow cooker potato recipe you’ll ever find! My family loves this with LOTS of garlic! These mashed potatoes are the best on Thanksgiving! So delicous! This is the only way I ever do mashed potatoes anymore!!! So good! Tracy- cut them into smaller pieces and it will speed them up!! One more question…I noticed the recipe says, “1/2 cup Tbsp heavy cream or Greek yogurt”. Should I use a half cup or 1/2 tbsp? Have you noticed a difference in flavor using the Greek yogurt as opposed to heavy cream? Thanks again! haha- whoops! Thats a major typo. It’s 1/2 cup. I’ll take that tbsp out right away. The greek yogurt makes it a little tangy, but would be pretty comparable to sour cream. If you usually make mashed potatoes with heavy cream, go for that- if you like sour cream you can add it or the yogurt. Mashed potatoes are such a personal thing- though I will admit I am the least pickiest person when it comes to potatoes. I like them with the skins in and not super smooth- but really, I haven’t met mashed potatoes I don’t like (just look at my waistline and you’ll see that’s true!). You can tweak it to fit your favorite recipe, or try this basic one- just replace any mashed potatoes boiling with this crockpot method and then go ahead and make as regular (keeping it in the crock to keep them warm instead of a big stock pot). As far as the crockpot, mine is is a 6 quart- and this recipe only fills up about half- so you should be able to double it. The only thing that might be tricky is the actual mashing- if it is too tight, you might want to dump it in a stand mixer to mash the potatoes and then back into the crockpot. It just depends on the size of the potatoes and your skill at using a handheld mixer or masher (I am particularly messy, so I’d have to do this in the stand mixer to avoid having spuds all over my kitchen). Sorry- try it with 2, but you’ll just want to watch to be sure the liquid doesnt totally cook off (which would burn your potatoes). If there is a ton of leftover liquid, just drain it off. Hi, Courtney! About how many servings, or how many people, would you say this serves? Does it fill the whole crockpot? Thank you so much! My crock pot is a 6 quart. You should be fine- but it might get a little tight so you might have to mash them in a stand mixer unless you’re super skilled with a handheld (I am not- I’d have potatoes everywhere!!). It should be ok for the cooking and keeping warm as a doubled recipe though. Holy cow, girl! This is brilliant! !